What do you need to play with? It isn't much and is doesn't have to cost you much either, but there are a couple of things you might want to gather, to assamble your own MEATS kitchen. Preferably, the contents of the kitchen are made out of natural materials. In our modern everyday life, our senses are most of the time involved with synthetics, like plastics and other highly processed and painted and coated materials. To counter all that and to get in touch, literally, with the more fundamental ' raw' parts of life, also in ourselves, it helps to touch a variety of natural materials. Our Primal brain recognises those, can relate much better to those and is confidently able to process experiences that involve natural materials, thanks to eons of experience with that. The spices are mentioned on another page. Images of my MEATS kitchen are down below as an example. But please, feel free to make it entirely to your liking! Of course you can ' buy' many of these items new in a store. 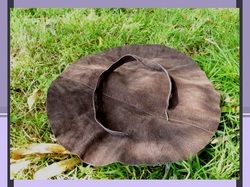 I found it good fun to be a hunter/gatherer myself and go through my household to see what is already there, be on the lookout in nature and find things for almost no-money that are re-cycled: through charity shops, car boot sales etc. 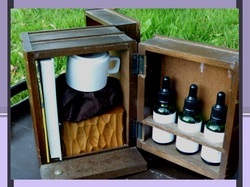 Find ( or make) something that can be the container for all the other objects. Portable would be recommendable, so you can take it to a quiet place. Find a collection of small objects with a variety of characteristics. These objects ( again, preferably form natural materials) represent your emotions. Being comfortable to hold these natural materials in your hand, is giving a strong signal to your system that you can be comfortable, don;t have to scare away, from the variety of emotions within. It is recommendable to make some notes of your experiences with using the MEATS. Find a nice looking booklet, inviting to write in and a nice pen, that fits in the box, to have it at hand. Find three small bottles, ideally with a drop dispenser system in the cap. if and when you decide to have a go at downloading the three MEATS essences, you can store them in these bottles. Find ( or make) a pouch. I like it to be leather, since its qualities are very close to the 'energy field' within that is containing our human experience: animalistic, actively letting some things 'in' and other things ' out'. But for those who object against using animal skin, it can be made out of felt or plant fibres like, cotton, flax, hemp and nettle. I like the image of it being a circle, representing ' life' as a whole, with no beginning and no end. Use a piece of string, or the same material to be able to tie it with. You'll need a bowl, something that can contain a (small) quantity of water. Have it big enough for the pouch to lie comfortably on top of it. Create a couple of carriers with a number of holes in it, in a pattern. 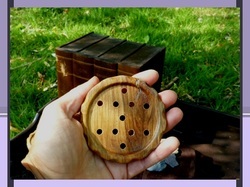 I really like these: a round wooden carrier with 13 holes in this pattern. It is sturdy and the placement of the holes is very versatile to make many harmonic designs with. Find some string from a natural, still flexible material, thin enough to go though the holes, long enough to complete a full design on the carrier.